In March, 1945, the US Army, Navy and Marines, with the support of the British Pacific Fleet, launched "Operation Iceberg" against the Japanese Island of Okinawa, in the Ryukus, a key stepping stone for the invasion of the Japanese home islands. US troops landed successfully, leading to one of the bloodiest land battles in World War II. 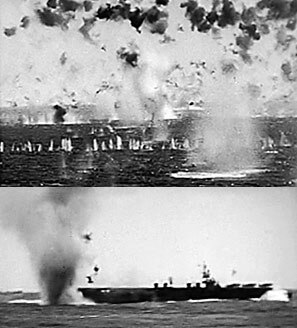 In response over the next tree months,the Japanese launched a series of terrifying kamikaze suicide aircraft attacks from land bases only 350 miles away against the screening Allied naval forces.